Russia's chief prosecutor says he has launched criminal proceedings against London-based exile Boris Berezovsky. Mr Berezovsky had told the Guardian newspaper he was plotting "revolution" to overthrow President Vladimir Putin. The tycoon later clarified his words, stating that he backs "bloodless change" and does not support violence. The Foreign Office said it would "look carefully" at Mr Berezovsky's comments, and that it "deplored" any call for the violent overthrow of a sovereign state. 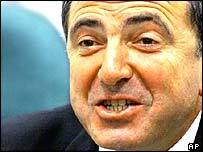 Mr Berezovsky was granted political asylum in the UK in 2003. He told the Guardian that "we need to use force to change this regime" - referring to President Putin's administration in the Kremlin. Mr Berezovsky also said he was giving financial support to unnamed members of Russia's political elite who wanted to force a change of leadership in Moscow. The Kremlin said the comments undermined Mr Berezovsky's right to refugee status in the UK. Following the Guardian article, Russian Foreign Minister Sergei Lavrov again called on the UK to extradite Mr Berezovsky and said he should be stripped of his refugee status. Speaking to the BBC on Friday, Mr Berezovsky explained why he was considering a violent transfer of power in Russia. "Of course I'd prefer it to be peaceful - I don't like violence. But the problem is that for centuries the Russian authorities have been violating the Russian people, turning it into cattle. "Take a quick look at what's being shown on Russian state television - any channel - and you'll see that, under the cover of being 'the legitimate authorities', they're violating the Russian people. "Therefore, unfortunately, I can't say that this revolution will be without blood. But I tell you - it will happen, with 100% certainty," Mr Berezovsky said. In his later statement he said he wanted to see Russia become a free and democratic country - but that fair elections were not viable under the current regime. "I do support direct action. I do not advocate or support violence," he said. Former world chess champion Garry Kasparov, who now heads an opposition group called Other Russia, said Mr Berezovsky's comments are quite damaging. "Government is using such firing statements to accuse us of preparing the armed resistance, some sort of violence, while we are sticking with the very peaceful actions," he said. Mark Field, the MP in whose constituency the radiation poisoning of former Russian spy Alexander Litvinenko is thought to have happened, said Mr Berezovsky was using the UK as a "safe haven" for a campaign of political agitation. Mr Field said: "The deal has got to be pretty straightforward enough for any political refugees coming into this country. "If you want to come to live here, you've got to abide by our laws and not undermine the political and diplomatic interests of this country." The BBC's Russia analyst Steven Eke says Mr Putin continues to enjoy approval ratings of well over 80% in Russia and a majority of Russians would welcome him staying in office beyond his constitutional limit of two terms. Mr Berezovsky, on the other hand, is a public hate figure in Russia, our analyst says. Mr Putin has not only consolidated his own grip, but also surrounded himself by like-minded people, drawn overwhelmingly from a security service background, whose loyalty has never been questioned.